It's been a week since the last post and not much has changed in the world of the Tompkins Square hawks. We've had another week of gloomy cold weather, so I thought maybe today's sun might bring about some nest activity. 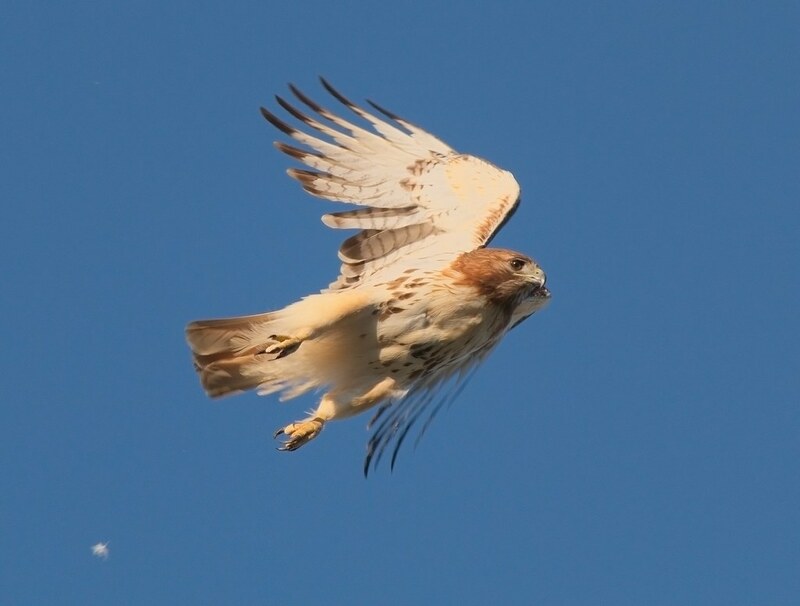 Late in the day, the hawklet roused itself for a few jumps and wing flaps. As far as I know, the nestling has not branched yet, but often perches on the edge of the nest. By contrast, the youngster over in Washington Square has been very active running, jumping and flapping on the ledge that houses its nest. 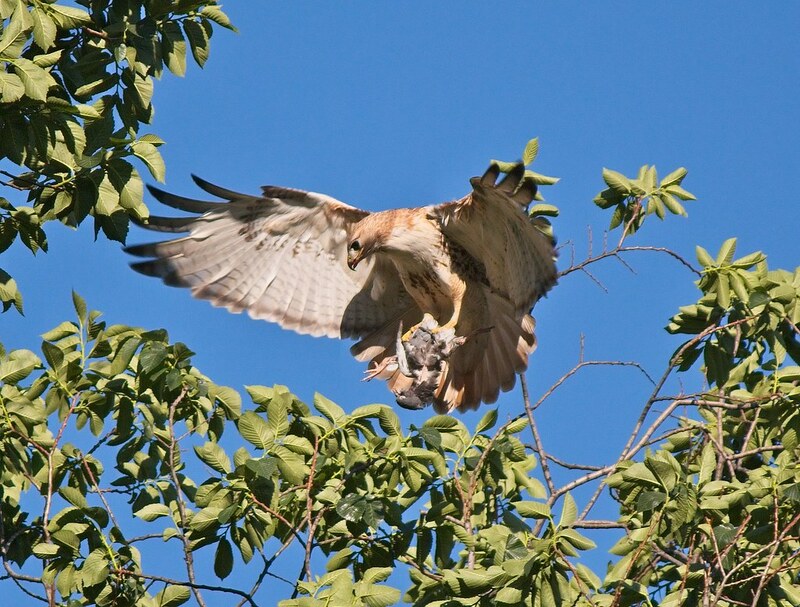 Roger Paw has been doing a great job documenting that hawk family, and posted a series of photos that show the hawklet playing with a plastic bag. I tuned in to the live NYU web cam yesterday in time to see the young hawk playing with a plastic bottle ring. I was afraid the ring might slip over the hawk's head, but thankfully, it didn't. The incident highlights the importance of keeping control of our trash and its effect on wildlife. 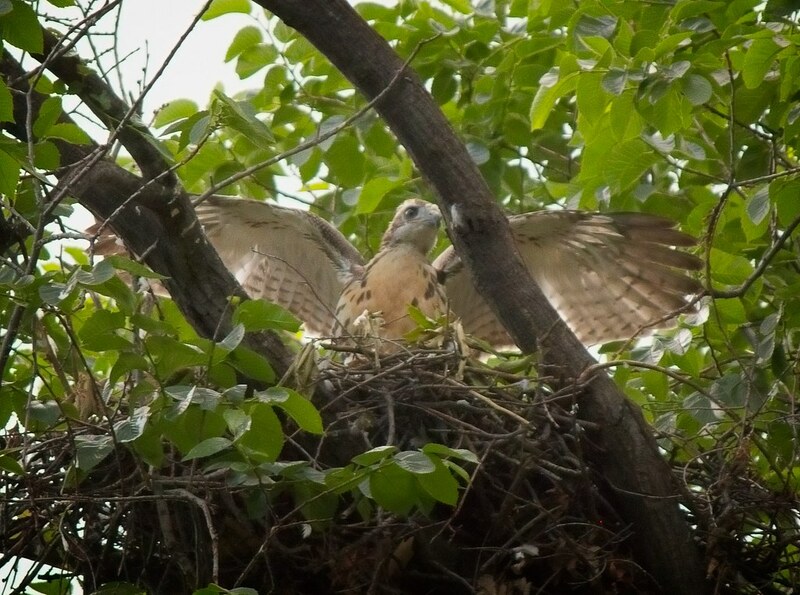 Meanwhile, back in Tompkins Square, the nestling showed off its wing and tail feathers. The wings look full size, but the tail is still a bit short. Dad Christo makes a vertical drop into the nest with a dinner pigeon. I've been thinking about the differences in each of the last four nesting seasons for these hawks. Their first nest on the Christodora with three kids was exciting as I'd never seen anything like that before and it was an entirely new experience. I had no idea what to expect and the nest on the air-conditioner seemed so precarious. 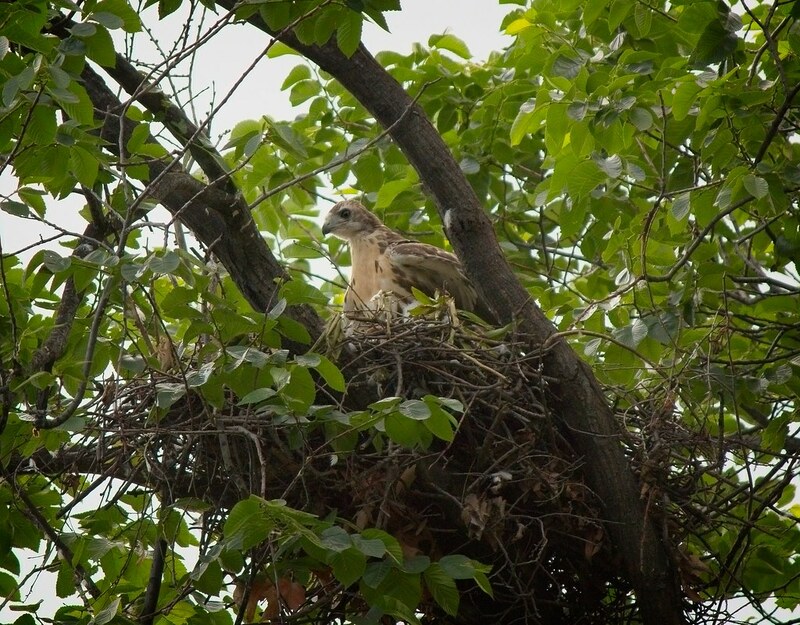 The following year, the hawks chose and even more precarious location on an even smaller air-conditioner overlooking the traffic on Avenue A. I had major anxiety that whole season, but all three offspring fledged successfully. Christo and Dora made me so happy last year when they chose to nest in a tree in the park. Finally, it seemed they were doing something smart and safe. The three kids from that nest seemed so well-adjusted and the whole family had an air of ease about them. The parents appeared to be much more relaxed and organized. This year has been odd from the start. Personally, I didn't like the location of the new nest and still don't understand why they didn't choose to reuse the previous one, which seemed perfect. We've had a lot of bad weather this spring, which could have affected the eggs, but we'll never know for sure. And with just one kid, the behavior of the birds is much different. Christo and Dora don't seem to have as much to do, so they spend a lot of time either quietly perched near the nest, or more recently, outside the park. As the chick is an only child, it has all the food and space to itself, so there is no competition for those things. The chick hasn't displayed as much curiosity as those in years past - this time last year, the kids were actively exploring the nest tree. Maybe this hawklet just needs more time to develop, or maybe it just has a naturally mellow disposition, but I hope to see it get more exercise as the weather improves this week. 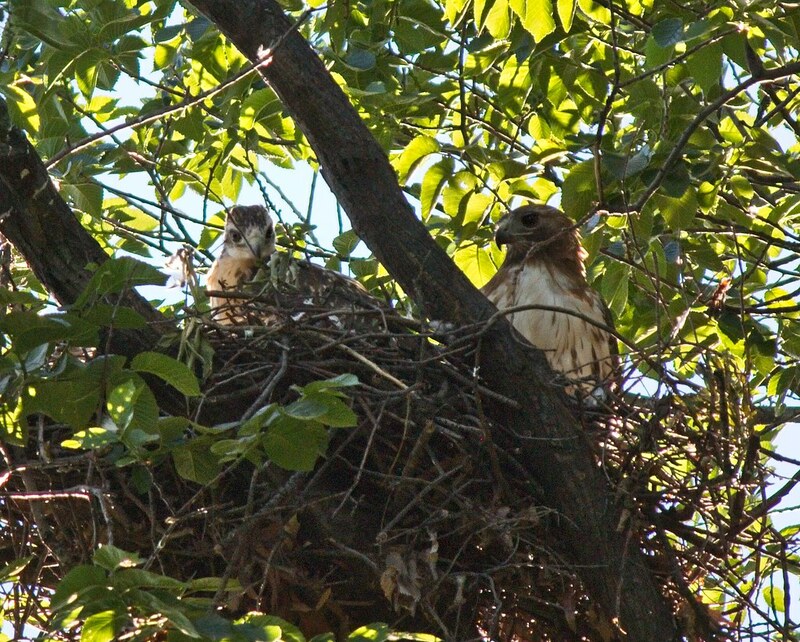 The Washington Square hawklet hatched on April 16, and I am estimating the Tompkins Square hawk hatched two days later. 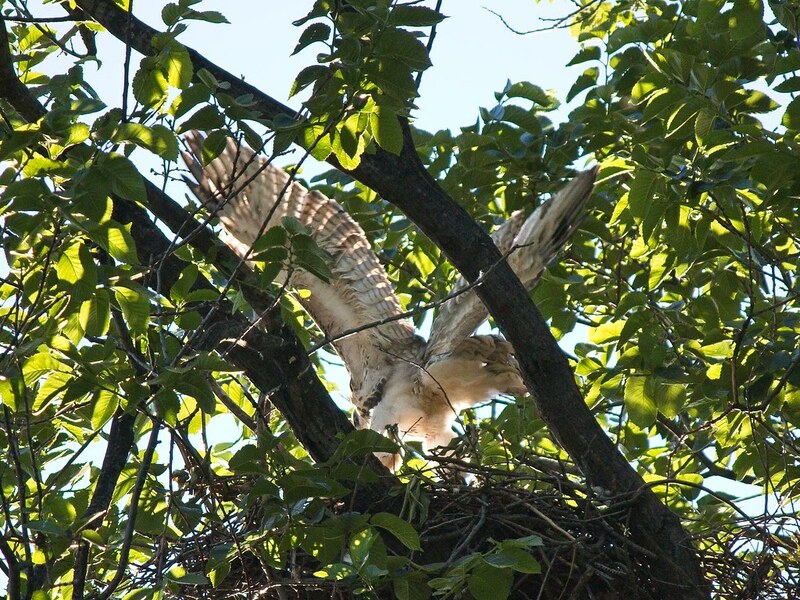 Last year, the first Tompkins Square egg hatched on/around April 23, and the first fledge was on June 9. The Washington Square hawklet looks ready to fledge any time, and I expect the Tompkins Square hawk to follow. Note she now has all her tail feathers, so she re-grew the ones that came out in March. She is not expected to molt until July, so it's interesting to see her tail is back to normal now. 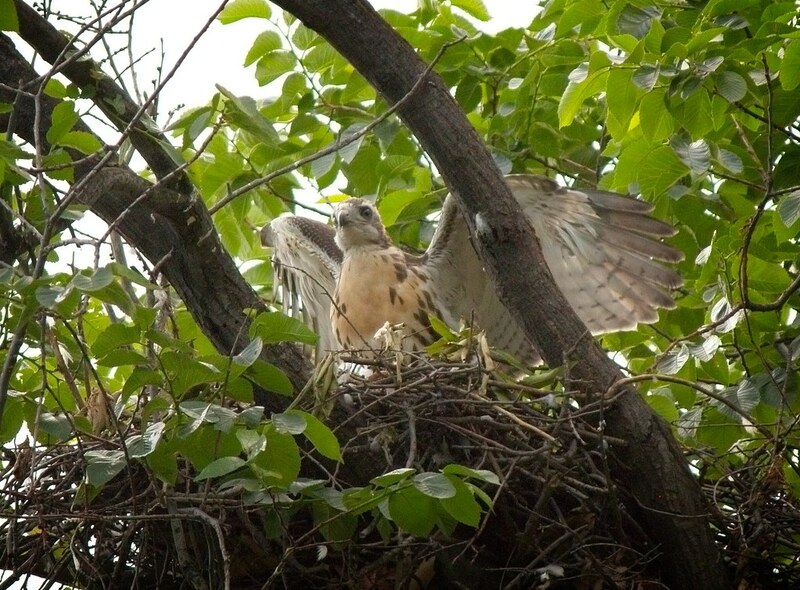 Other hawk nests in the city have already started fledging. Pale Male's kids were first this year. You can follow their progress over at Urban Hawks. 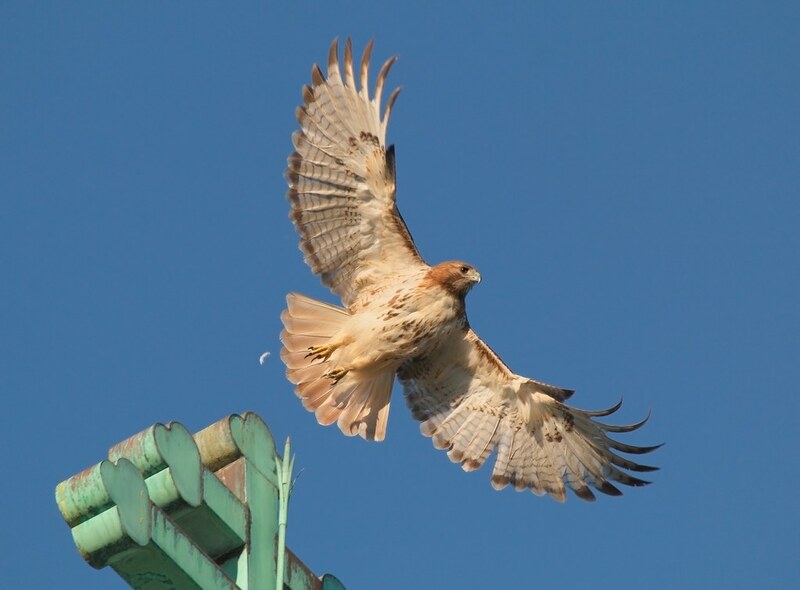 And check out Morningside Hawks for updates on nests at Grants Tomb, St John the Divine and locations further uptown.